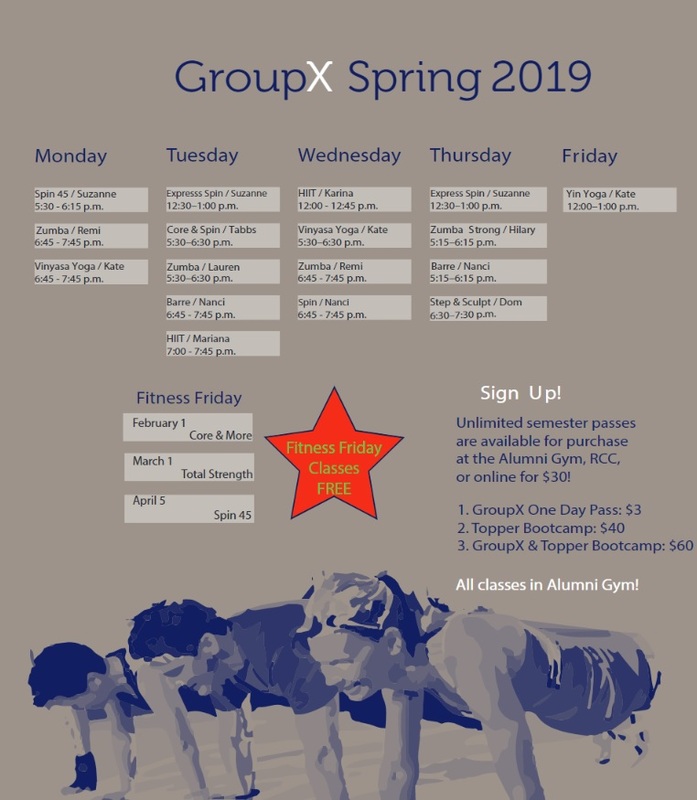 Creating a community of support, fun and challenge, the GroupX Fitness program offers over 20 fitness classes per week. Formats have included Zumba, Yoga, Boot Camp, Spinning, Barre Blaster, Kickboxing, Abs, Cardio Pilates and more. Classes are primarily held in the UFCU Alumni Gym. Any and all levels of fitness are encouraged to attend all classes. Our nationally certified instructors ensure you have the best experience for YOUR GOALS! Each semester we offer a free preview period so participants can come and experience GroupX before purchasing a semester ($30 PER SEMESTER) or 1 Day ($3 per class) pass. The Spring 2019 preview will run January 14 - 18, 2019. After purchasing your GroupX pass, bring your SEU ID to the front desk at the UFCU Alumni Gym before attending the GroupX class. After verifying that you are eligible and have paid for your GroupX pass and you will be granted access to class. Class attendance is on a first come, first served basis. Some formats have class limits. Participants without a GroupX pass will NOT be granted access to the class. Just want to attend 1 class? For information on what to expect in each class, review the class descriptions.